If you have used chat links before, you know that they can be used to link in-game objects, such as waypoints, through the chat panel. However, chat links can also be used in the Guild Message Editor to display the locations of various rich resource nodes. By copying and pasting a list of resource node waypoints into your Guild’s message of the day, you’ll have access to an easy to reference list of valuable resource nodes displayed through the guild chat panel. If you have an extra guild slot, it is recommended that you create a personal guild for the sole purpose of displaying these chat links, as to not interfere with your official Guild’s messages. The following chat links were provided by Reddit user /u/f1ying and offer a condensed list containing many of the most valuable resource nodes in Guild Wars 2. Since the Guild message of the day has a character limit, there are two list options that offer either more node locations or longer descriptions. Of course you can always customize the codes to make them fit in with your goals. Once you’ve determined which chat codes you want to use, the next step is to copy the links and then paste them into your Guild’s message of the day box. After that you should see them displayed in your chat box, as long as you have guild chat enabled. To use the links, simply click on the Waypoint name and travel to your destination to collect your resources! 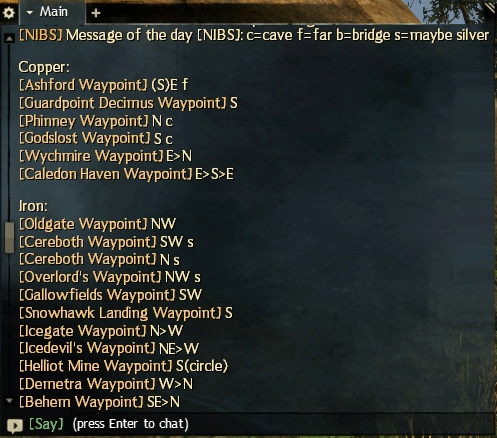 If you want to add different Waypoint links to your Guild Message, you can look them up on the Guild Wars 2 Wiki’s “Map Codes List”.